The theme for the bi-annual forum of the African network for Social and Solidarity Economy was “Social and Solidarity economy, a pathway for inclusive economic development and lasting peace”. It took place between 10th and 14th July. Although it was originally supposed to have been organised by the Guinea network, it was finally held in Bamako, hosted by RENAPESS, the Mali network. The Guinea network was unfortunately unable to host the meeting for reasons beyond their control. As planned in the programme, the Forum began on the 10th July with an official opening ceremony presided by the Mali Minister for Solidarity and Humanitarian Action. The Minister’s speech was rich and full of promise for RENAPESS and their partners. There were also presentation speeches, a welcome speech by the Mayor of Bamako and a speech to present the context made by the president of RAESS, Madani Coumaré. Both the government of Mali and the city of Bamako are genuine partners for developing SSE in Mali, as well as a source of inspiration for other African countries. The national policy on SSE and introduction of a specific instrument to promote SSE through the CNAPESS (National Centre for Supporting the Promotion of SSE) were presented. Following these speeches, there was a visit to the stands and presentations of African initiatives were made by the different country networks. The countries that participated were: Senegal, Mali, Benin, Cameroon, Côte d’Ivoire, Togo, Guinea, Burkina Faso, Morocco and Tunisia. Each of these country networks made a brief report on their activities and presented their perspectives. In the following days there were various other presentations and workshops that dealt with various issues (food and agriculture, social protection, gender, support mechanisms etc.) as well as the issues related to employment of youth and the strategies of social entrepreneurship. One of the key questions posed was how can sustainable social entrepreneurship operate in synergy with public policies in cities, and how can it be seen as a means of combatting illegal migration, rural exodus and promoting peace and prevention of crises? Following various interventions and fruitful exchanges it became cleaar that the top priorities should be the practise of social entrepreneurship and education on citizenship and civic-mindedness. This would also require support from public authorities and partners if the youth initiatives are to be achieved. A self-managed youth camp took place parallel to the Bamako meeting of RAESS. We have not yet received the full report from the camp organiser, but it is important ot mention that the youth perspective was mentioned from a continental perspective, with a view to building synergy between youth form the different member networks of RAESS. Youth expressed their need to organise and implement the projects that are their priorities. This was possible thanks to the conference, training sessions and other exchanges that the youth held not only with the public body representatives, between their respective leaders but also with the RAESS representatives and the Executive Secretary of RIPESS who had been invited to participate. The youth expressed their opinions very clearly and freely as well as the needs that should now be analysed to be the focus of discussions and preoccupations aimed at providing concrete, sustainable proposals. 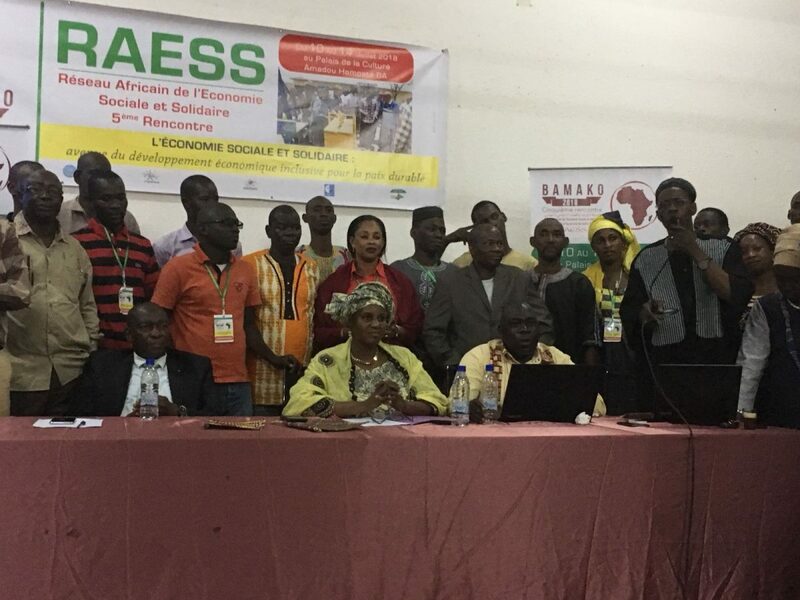 After the Bamako meeting RAESS held their General Assembly and decided to establish a dynamic to link youth to all the country networks and thus develop synergies. This initiative will be called “Youth Perspective” and will enable the needs of youth in terms of training on citizenship and civic-mindedness to be met, as well as training on social entrepreneurship and support for developing social and solidarity initiatives and convergence of local and continental as well as international actions. Our society is more and more complex and divided into silos. Youth therefore often find it difficult to find their way through segmented programmes. We need to provide adapted responses to their needs and support them. All youth should have their rightful place in public policies on SSE as well as in the dynamics developed by the actors and private partners in SSE. Given the growing needs, the key challenge is therefore to develop territorial solidarity at local level by building links and social networks. Citizens can thus play their part as actors within society. The idea is therefore for RAESS to propose the creation of a working area called “Youth Perspective” within he RIPESS-Intercontinental to guarantee the synergy of different global practices and make the importance and potential of youth work more visible. This would imply setting up a working group within RIPESS with the participation of all the youth representatives of the different continental networks.